Over almost 70 years, UNRWA (the United Nations Relief and Works Agency for Palestine Refugees) has provided services to one group: Palestine refugees forced to leave Palestine during the second half of the 1940s following the Arab-Israeli conflict. In the beginning, UNRWA provided care to 750,000 people; today, around 5 million Palestine refugees are eligible for their services. 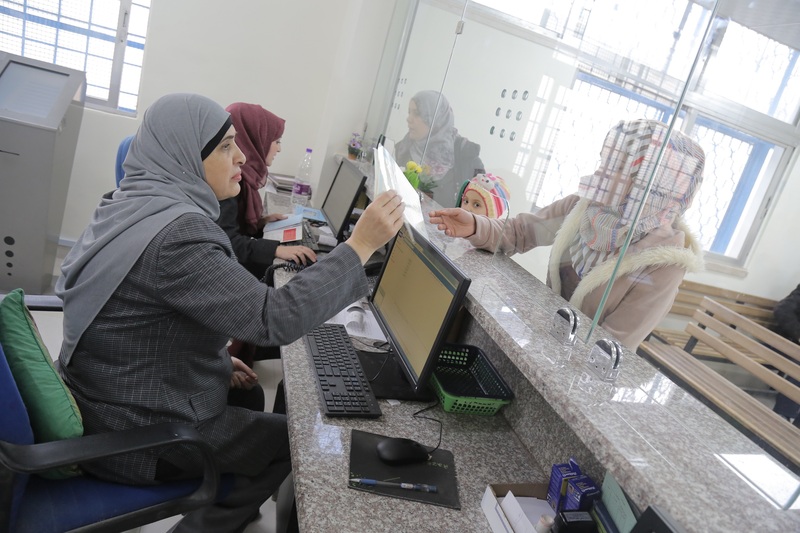 Over the years, UNRWA services have clearly grown and developed: the health care networks (clinics, staff, and procedures) through which the agency works have become a strong unit able to withstand difficult and often unpredictable changes. This includes the ongoing crisis in Syria, where Palestine refugees originally displaced during the 20th century have had to move again, either within Syria, to neighbouring Lebanon and Jordan, or further afield. Our research project explores the impact this conflict has had on UNRWA and how the system adapted and transformed in light of these challenging circumstances. Supported by R2HC funding, researchers at the Institute for Global Health and Development at Queen Margaret University, Edinburgh and the American University, Beirut are finding out what health system resilience is by focusing on a health system faced with long-standing challenges, including financial shortfalls and active conflict. Now, near the end of our project, Dr. Nimer Kassim, Field Family Health Officer in the UNRWA Lebanon Field Office, has discussed what insights our work has given their health system. He described how our research has helped his department understand where UNRWA currently stands, where areas of potential weakness lie and how they can be addressed. What has this research project taught you about UNRWA and its resilience? What do you think are some areas of potential weakness within the UNRWA system? What does the future hold for UNRWA? Dr. Ishtaiwi Abuzayed, Chief Field Health Programme from UNRWA Jordan added, “The conflict in Syria continues to have shattering consequences for ordinary people that have lost their homes, livelihoods and security over the last 7 years. Palestine refugees are one of the communities worst affected by the conflict. They rely on UNRWA to provide life-saving aid including food, water, shelter and medical assistance for the over 17,000 refugees registered with UNRWA in Syria who have fled to Jordan. Dr. Akihiro Seita, the Director of Health at UNRWA, said: “UNRWA has struggled over the seven decades of its work to provide vital services to Palestine refugees, not only to make sure that its service delivery continued, but also strived to improve, with very limited resources, the quality, access and coverage of these services. While learning a lot about the complex UNRWA system, we as researchers have gained a lot as well. Our research has given us access to data across three distinct settings: Syria, Jordan and Lebanon. This has given us knowledge on what promotes resilience in health systems that are suffering from long-term humanitarian crises. We will be able to share this knowledge to guide other health ministries or agencies in maintaining services and levels of care when experiencing difficult circumstances. This means that the patients who need care the most won’t have to suffer more than they already have.